Kerala Blasters' Lalruatthara, who has cemented his place as a lynchpin in the defence unit has penned a new deal which will see him stay with the Blasters until the end of the 2021 Indian Super League season. The defender made a total of 17 appearances in his stint with the Blasters as part of the 2017 season and was an integral part of the setup that emerged runners-up from the previous edition. The 23-year-old defender had his first taste of competitive football when he signed for Aizawl FC as part of the 2015-16 season of the I-League and represented the club in the next season as well, aiding Aizawl's title victory that season. Later that year, Lalruatthara made a move to the Delhi Dynamos but did not feature in a single match and had to wait another year to make his ISL debut, with the Kerala Blasters. The Blasters procured Lalruatthara's services in the fourth round of the player draft as part of the fourth season of the Indian Super League, an addition which has proved to be worth its weight in gold with the defender bringing his bag of tricks to the fore. 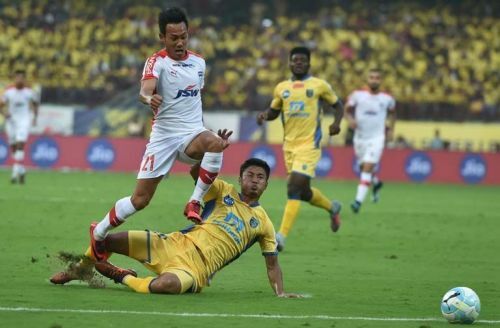 Gifted with a unique ability to adapt to situations, Lalruatthara has played in three positions, centre-back, left back and right back for the Blasters. Head coach David James showered a lot of praise on the Mizoram-born youngster and pipped him as a bright prospect for the future. With the Blasters failing to qualify for the semi-finals of the ongoing Indian Super League, the 23-year-old youngster will look to shift his focus towards the Indian preparatory camp ahead of the 2019 AFC Asian Cup qualifiers. An imperative part of the Blasters' setup for the 2017/18 ISL season, Lalruatthara's contract extension can only mean good times ahead for the Kerala Blasters FC.